We are delighted to have been awarded the Princes Teaching Institute Mark for the third year running. As well as focusing on developing teaching and learning, including challenge for all initiatives, we have continued to work extensively beyond the curriculum, sharing ideas and resources with other Geography departments across the country, launching our new online portal in September last year www.geobytes.org.uk and organising and leading training for Geography teachers across the county on the use of ICT and GIS. 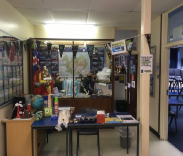 Some of our other new-initiatives have included the “Great Geography Breakfast” (as part of fair-trade fortnight) and establishing a well received A level Geography Ambassadors scheme. We look forward to continuing our work with the PTI through the 2016-2017 academic year as we continue to strive for excellence and endeavour to enthuse and spur on the next generation of geographers. The department would like to thank the Year 12 and 13 Geography Ambassadors who helped out at the successful October Open Evening. 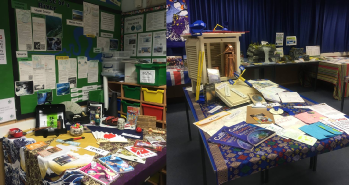 The department was buzzing with Year 6 and 11 students and parent/carers. Some of our Geography Ambassadors also supported our Fairtrade initiative by serving Fairtrade tea and coffee. We would also like to thank Costa in St Ives for kindly donating cups to support us with this. The Year 6 students took part in a number of practical geography activities including the use of OS maps and many entered a competition to win a brand new Atlas which was won by Gracie from Westfield Primary School! A number of our Year 13 students have taken part in the RGS's 'Geographer of the Year' competition, submitting essays exploring the question "How is Britain Changing?" giving them an opportunity to research and develop their own ideas and opinions on the implications of a range of changes in both the physical and human geography of Britain. 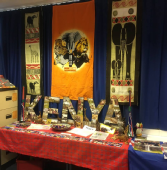 We have recently started a 'stretch and challenge' library in the department for our sixth form geographers with an emphasis on reading around the subject from a range of different perspectives. As well as topic specific books such as Geopolitics and Climate Change there are texts which explore the evolution of societies around the world and human geography as we know it, such as "Prisoners of Geography" and "Guns, Germs and Steel". 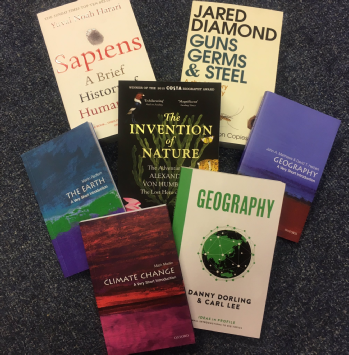 Students are welcome to borrow any of the books and we encourage it as part of developing students ability to 'think like a geographer' and the development of 'flair' two important aspects to reach the highest grades at A level. (a small selection shown in the picture). Our A level Geographers also have a dedicated twitter feed in which relevant news stories are frequently shared. These are also shared via our Facebook page. 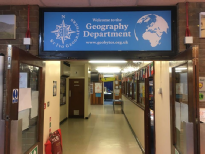 The department have been looking at how best we can support our Year 13 students who are applying to study Geography at University and we have now published some resources to support these students on our online portal here http://www.geobytes.org.uk/geographyuniversity.html. We were also delighted to welcome Dr Iris Moeller from the University of Cambridge Geography Department (a coastal geomorphologist and Deputy Director of the Cambridge Coastal Research Unit) into the department back in September. Dr Moeller met with 7 of our Year 13 geography students to discuss Geography at University and answered many questions they had on applying for university courses. We would like to extend our grateful thanks to Dr Moeller from the Year 13 students who attended the session - they found it extremely informative and useful in their preparations for applying for university. Staff and one of our sixth formers recently attended a lecture of the Cambridge Geographical Association branch on the geography of disease " Bumpy road to zero - tackling Ebola in Sierra Leone" given by John Raine (OBE), father of our very own Miss Raine. A fascinating account of the helping Sierra Leone cope with the devastating impact of the Ebola crisis and the geography underpinning the challenges and response. 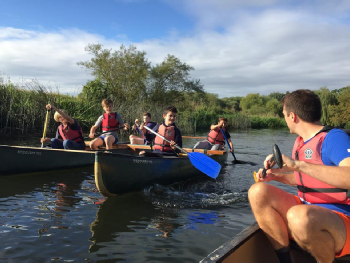 This is just one of a programme of evening lectures held in Cambridge during the year and these events will continue to be advertised as optional extras for our sixth form students. 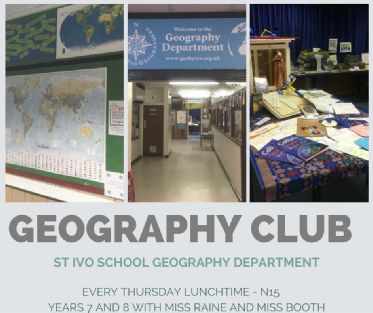 We are delighted to have re-launched Geography Club for this year. More than 20 students from Year 7 and 8 attended our first meeting and the club will meet every Thursday lunchtime in N15 with Miss Raine and Miss Booth. All those interested are very welcome - students should see their Geography teachers if they have any questions or would like further information!